I am happy to report that the Furikake Salmon Ramen (page 82 of Simply Ramen by Amy Kimoto-Kahn (2016), or online here) is nearly as delicious as a leftover as it was freshly made for dinner. 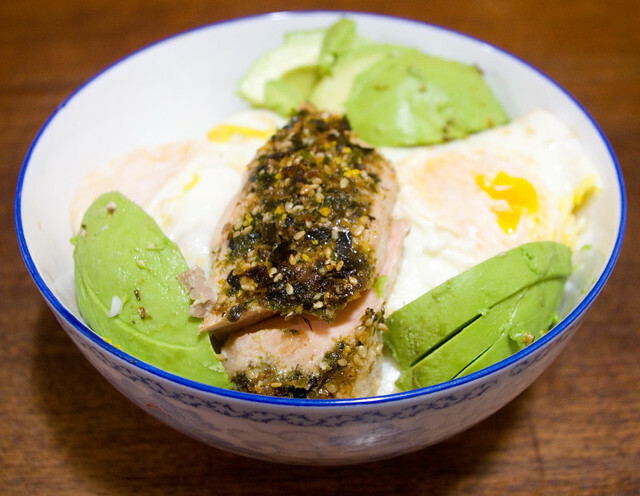 In an attempt to cook as little as possible the other night, I served the salmon on some steamed rice topped with eggs sunny-side-up and sliced avocado. Of course, the apple pie and brownies from Mom’s birthday dinner are long gone, devoured by voracious children. Okay, I might have had some too. But the kids are the main culprits, I swear. Posted on September 21, 2017 September 21, 2017 by owntwohandsblogPosted in CookingTagged Asian fusion, dinner, fresh, healthy, homemade, leftovers, quick meals, rice, supper.